Instructions: Find Jupiter in the southern sky. 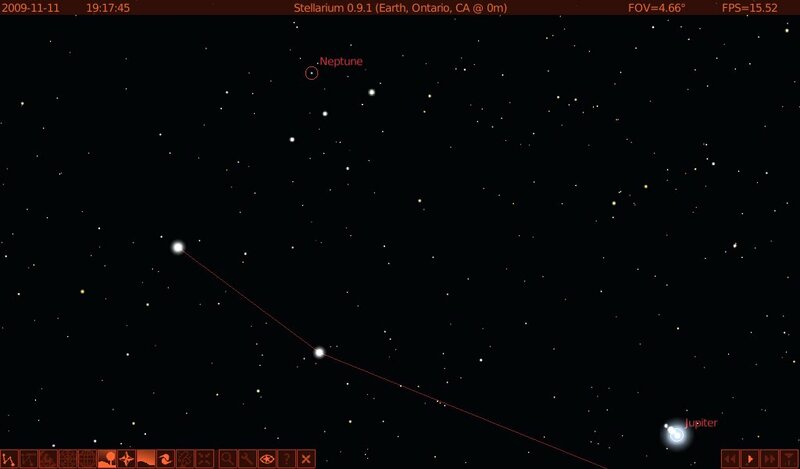 About three degrees to the left are two bright stars in a row, part of the group of stars that mark the northeast corner of the constellation Capricorn (if you’re not familiar with Capricorn, look it up in Stellarium or on this month’s free sky map). Just above the farther and brighter of the two stars, and forming a right triangle with them, is a cross- or X-shaped group. The three middle stars are the brightest, the one on the lower right is dimmer, and the one on the upper left is Neptune (remember that left and right are almost always reversed in a telescope, and often up and down as well). Once you’ve found it, you’re all done with task #12 in the Astronomical League’s Galileo Club. Neptune has one of the oddest discovery stories of any celestial object. Galileo spotted it twice but didn’t recognize it for what it was–which is perhaps excusable, since he was busy discovering almost everything in the solar system with a one-inch telescope. In the early 1800s, astronomers in France and England realized that anomalies in the orbit of Uranus pointed to the presence of another planet beyond. In the 1840s both John Couch Adams in England, and Urbain Le Verrier in France, calculated the position of the then-hypothetical eighth planet. Adams’ calculations were first, Le Verrier’s were better, but neither man had much success stirring up interest in a telescopic search for the planet. James Challis at the Cambridge Observatory did take up the search, but not with any enthusiasm. Le Verrier eventually wrote to Johann Galle, director of the Berlin observatory, to urge him to search for the planet. The very evening that he received the letter, Galle found the eighth planet, about one degree from where Le Verrier had predicted, and about 12 degrees from where Adams had predicted. Challis later realized that he had observed Neptune not once, but twice, before Galle, but didn’t recognize it as a planet, basically because he wasn’t paying attention. Challis is mainly remembered today as the man who almost discovered Neptune. Le Verrier first proposed the name Neptune, but then changed his mind and argued forcefully that the new planet should be named…Le Verrier. This act of literally cosmic arrogance was widely supported in France (naturellement) and widely detested everywhere else. The earlier name stuck. Neptune is 2.8 billion miles out from the Sun, more than five times farther than Jupiter, and 30 times farther than Earth. The solar system makes a lot more sense when we recognize Neptune, and not Pluto, as the most distant of the true planets: there are four rocky worlds, then a belt of rocky crap from back in the day, then four gas giants, then several associations of icy crap from back in the day, from the Kuiper Belt out to the Oort Cloud. Pluto is just one of many, many icy worldlets in the distant reaches of the solar system, and not even the biggest. The last picture here nails it, and the whole thing is worth reading. Anyway: 2.8 billion miles. Go have a look, and give that some thought. You are currently browsing the 10 Minute Astronomy blog archives for the day Wednesday, November 11th, 2009.